Ready to step up to a solid cam? 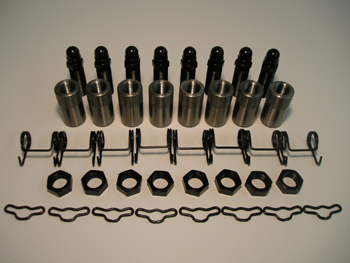 This kit includes all the necessary parts to convert your head to solid lifter. These solid lifters are the press-fit type (as opposed to set-screw) and will require to be pressed in with the use of a hydraulic shop press. In addition to this, the lifter bore provisions in your head will need to be machined downward .350" to allow clearance for the jam nut. This is not an operation that can be performed with the head still in the vehicle, and it is permanent. Instructions included.